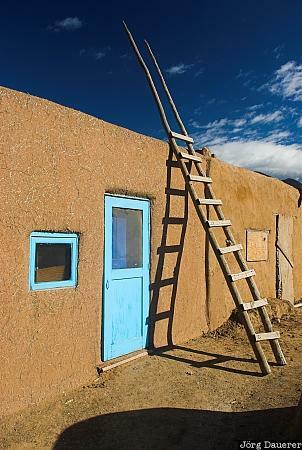 A blue window, a blue door, a wooden ladder and its shadow at an Adobe Building in Pueblo de Taos below a typical New Mexico blue sky. Taos Pueblo is near Taos in northern New Mexico, United States. This photo was taken in the morning of a sunny day in October of 2006. This photo was taken with a digital camera.